I know it says KTM on it, and I know it’s got a motor, but I promise the Kapoho is not a motorbike. As it happens KTM motorbikes and KTM mountain bikes are now separate companies, although nods to the former can be found in the latter and KTM e-bikes are assembled in Mattighofen, Austria, KTM’s birthplace. Perhaps the e-bike platform marks the perfect lovechild between the two; I intended to find out. The Kapoho 2973 looked big when I first laid eyes on it, and the numbers confirm this. It’s got 160mm of suspension front and rear to work with, and a wheelbase that measures in at a lengthy 1251mm in my size medium tester. This is around equivalent to what would be found on most brand’s size L/XL enduro bikes. Much of this can be attributed to the chain stays; at 495mm they’re some of the longest I’ve seen. The plus side of this is a lot of mud clearance (something I came to appreciate during my test). The reach is short by modern-long standards at 428, though it would have been pretty standard just a couple of years ago. In combination with the long back end it makes the Kapaho’s weight distribution biased more to the front wheel than most mountain bikes. The 66-degree head angle and 74-degree seat tube angle are as expected for this type of bike and offer fewer surprises than the length of the back end. The build is solid and reliable, albeit with a few quirks. 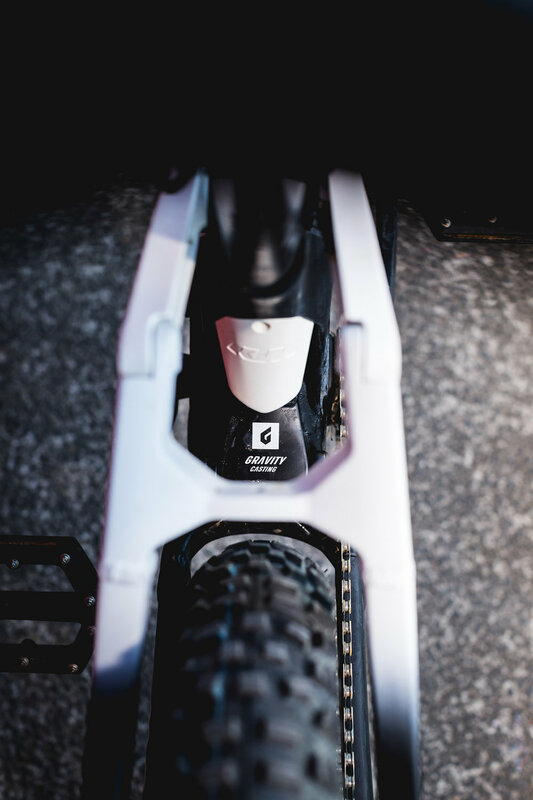 The Rockshox Yari/Monarch combo is a classic pairing, with the burly Yari being a very good choice for the additional weight of an e-bike. There is also a nice little mud guard protecting the rear shock. It might be small, but some truly atrocious mud encountered during testing demonstrated that it works very well. A mashup of SRAM NX and GX Eagle gives plenty of gears and reliable shifting. An unnamed pair of Shimano brakes grace the bars, but with quad pot callipers they’ve got heaps of grunt and are a welcome find. A KTM branded externally routed dropper post that looks suspiciously like a rebranded KS unit ticks the box for what’s become an essential piece of kit in this category. I would have preferred the ergonomics of an under-bar lever but that’s an easy aftermarket fix if you feel as strongly about it as I do. I was surprised to see Bosch’s Intuvia display on this bike rather than the Purion unit more commonly fitted on e-mtbs. The Intuvia does offer more information; it’s a bigger display, it’s backlit and has more data fields than the more compact Purion. For a commuter the Intuvia is a great pick, but I have some concerns about its longevity in an e-mtb setting. KTM’s NZ Importers electrify.nz agree, and are offering the bike as standard with Purion for their imported models (but if you prefer Intuvia, electrify.nz will supply your bike with that display). I appreciate this level of attention to detail from electrify.nz to get the bikes set up best for local conditions. 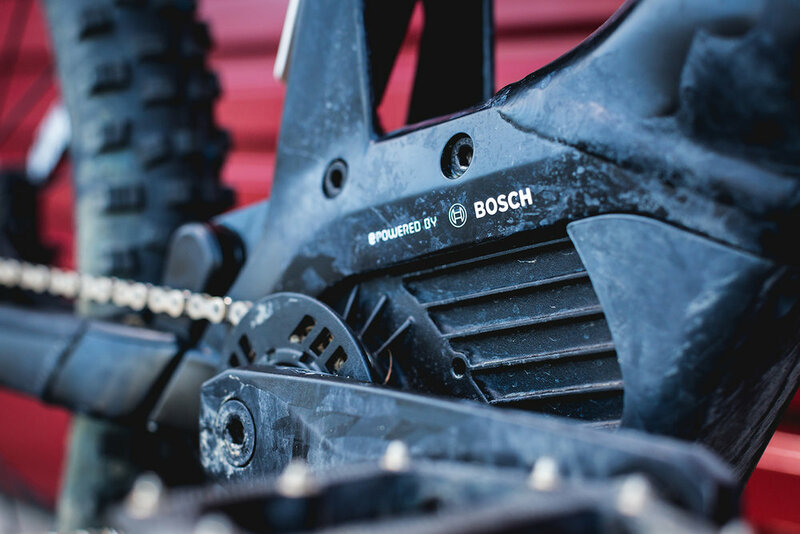 The Bosch Performance CX motor is a tried and trusted option, and KTM have done a great job of integrating the battery. I like how the charging port is up near the headtube as it avoids pedal vs charging cable incidents. The KTM reminds me a lot of one of those stretch hummers you sometimes see cruising the Auckland waterfront. It’s unapologetically big and that’s part of its appeal. If you’re after something a bit nimbler, you won’t find it here. But what the KTM can do is plough. The DT Swiss H1900 rims are stiff and provide good support for the Schwalbe tyre; a Magic Mary leading the way and a Hans Dampf bringing up the rear. The Rockshox Yari supports them; the front of this bike is hard to knock off line. Going uphill that’s a gift, as combined with the long rear the front doesn’t wander or lift on the steep stuff. It’s got quite a long stem which compounds this effect. Pushing through ruts quickly makes it clear that this bike is all about commitment. Once locked in to a line, you’re not going anywhere but where the trail says you will. In fast, wide open trails this is ideal as the bike can get a lot of speed up and stay that way, until you’ve had enough and those quad calliper brakes do their thing. In slow speed technical terrain, I would prefer something with lighter handling as being able to dance between lines is valuable in this situation; something the KTM is a little reluctant to do. Also, if you like to loft the front wheel when descending, this is not the bike for you – those long chainstays work to keep the front wheel very planted. On the other hand, if not-deathly-steep descents are your favourite and you prefer to keep the wheels on the ground, then you’re unlikely to wash the front wheel out on the Kapaho – it has front wheel traction for days! The mismatched wheels were interesting to try. The theory was that the 29’r would give more precision while the 27.5+ would supply the traction. In practice there is some merit to this; there is no vagueness in the front end. However I did find that the sheer length of the bike prevents this directness from being converted into agility. I personally would have preferred that the front wheel was also a 27.5+, albeit with a nice sturdy sidewall, as being an e-bike it is possible to run heavier tyres than normal without the weight penalty being much of an issue, which would keep the more direct feeling the 29’r wheel offers (no sidewall roll!) while also getting the increased grip the 27.5+ offers. The KTM Macina Kapoho is for the cruisers. It’s a big bike with an attitude that will stand up to anyone and anything that tries to push it around. If you ride a lot of wide open bike park terrain it’ll be a very good match, cruising on up and ploughing its way down. Similarly if you’re more inclined to sit back and let the bike do the work it’ll be a happy companion. More involved riders may find themselves wanting something a little more compact to duck and dive with but if you’re more Muscle Car than Go Kart then it’s worth introducing yourself. Available at electrify.nz shops nationwide and select independent retailers (see www.electrify.nz).